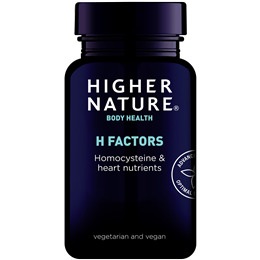 H Factors is a unique supplement designed to help ensure dietary intake of nutrients that may be involved in processes relating to the maintenance of homocysteine levels by providing four B vitamins, zinc and tri-methyl glycine (TMG). 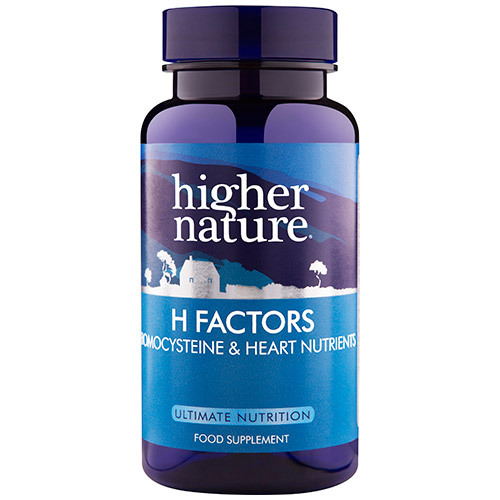 Healthy homocysteine levels are becoming a recognised factor in the support and maintenance of heart health. Homocysteine is an amino acid used normally by the body in cellular metabolism and the manufacture of proteins. It is produced by the body, usually as a by-product of consuming meat. Betaine monohydrate, capsule: hydroxypropyl methylcellulose*, colours: titanium dioxide, chlorophyllin; natural lithothamnion calcarea, folic acid, pyridoxal-5-phosphate, zinc citrate, methylcobalamin, anti-caking agent: silicon dioxide; pyridoxine hydrochloride, riboflavin. Below are reviews of H Factors - Homocysteine - 180 Vegicaps by bodykind customers. If you have tried this product we'd love to hear what you think so please leave a review.